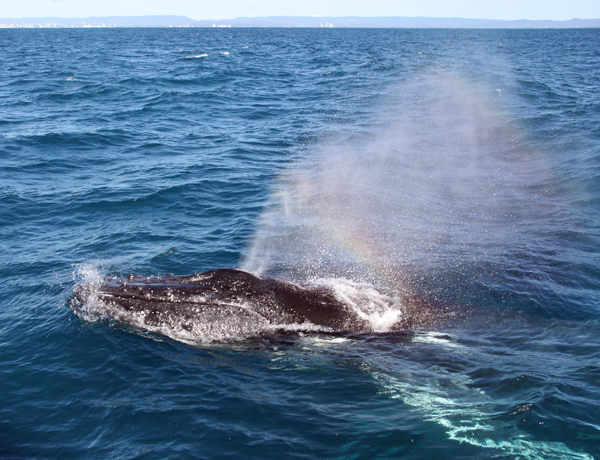 I’ve always loved whale watching, particularly from Point Lookout on North Stradbroke Island. With binoculars, you can see Humpback whales breaching off shore. 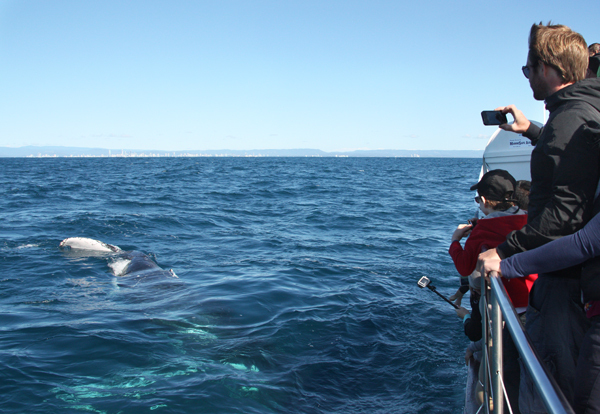 However, nothing compares to the amazing experience of having a whale pop up beside your boat and make eye contact. 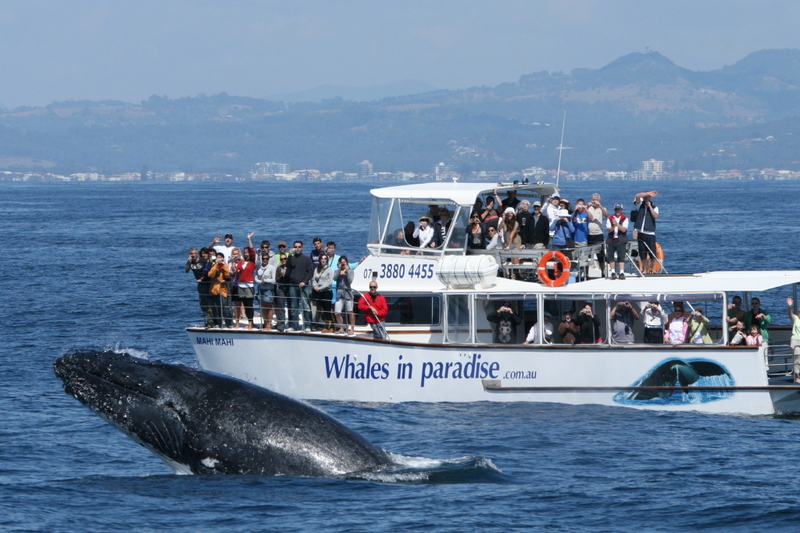 I was recently a guest on the Whales in Paradise whale watching boat. Two whales breached near us and these huge creatures spent the next forty minutes right beside the boat. They were watching us, just as much as we were watching them. 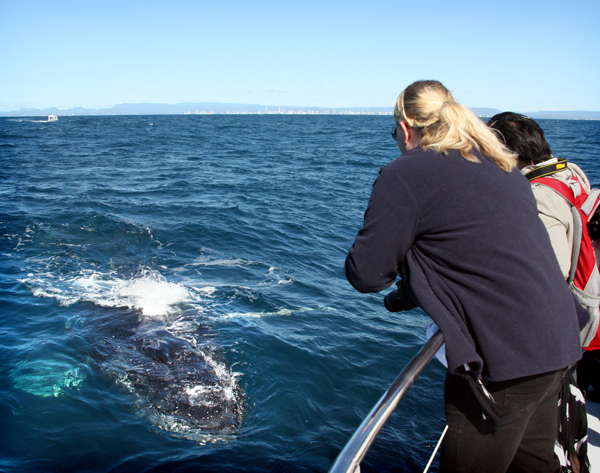 Whale watching is one of those experiences you’ll remember your whole life. 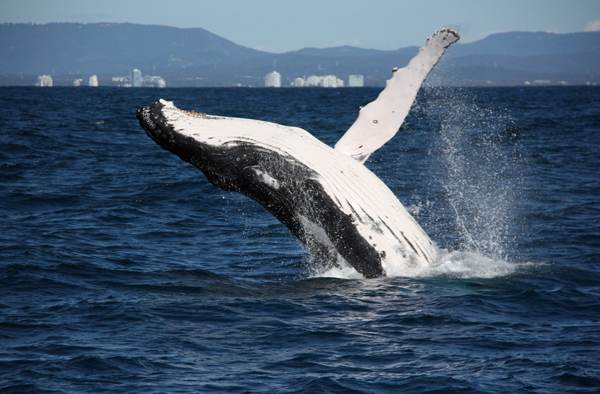 The whale watching season off the coast of Queensland, Australia, runs from about April to November. 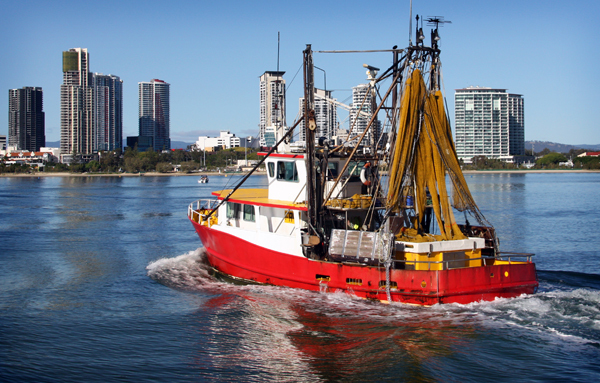 The Whales in Paradise boat takes on passengers right in the heart of Surfers Paradise and heads out to sea along the Nerang River. 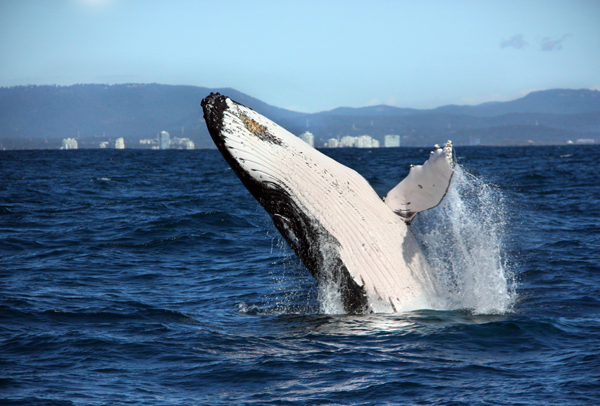 You can be surrounded by the sky scrapers of the Gold Coast, and a short boat ride later be amongst a pod of wild Humpback whales. Once we were out to sea, all eyes on board began to search for signs of whales. Eventually someone noticed a puff of mist on the water, the telltale sign of a whale exhaling through its blow hole. Within minutes there were three separate pods of whales, still quite a distance from our boat. Boats are not allowed to go closer than 100 metres to a whale, so after a while, our boat slowed down. All eyes were still scanning the ocean when suddenly, a whale breached not far from the boat and the passengers spontaneously cheered. 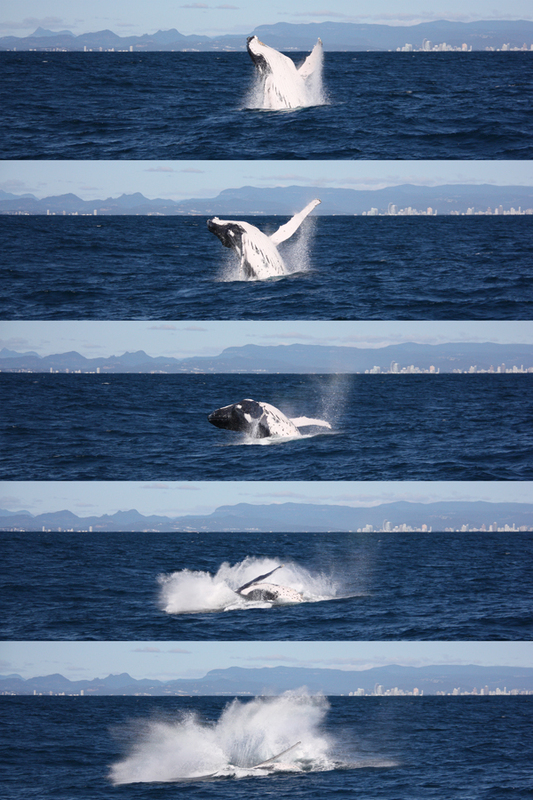 Within minutes, two Humpback whales began leaping out of the water and splashing down. I could feel the impact of the splash in my body, although they were not close enough to wet us. The Whales Wanted to See Us! The crew suggested cheering and waving to attract the whales. I was a bit skeptical the whales would respond, but they swam right over to our boat. It was quite clear these two whales wanted to look at us too, especially when they put their heads up out of the water so they could get a good look at the humans. This is called “spy hopping”. Being able to look into the eye of one these beautiful, wild creatures is an experience I’ll remember all of my life. We had an expert commentary from one of the crew members who follows the whale season around the world. He was able to answer all of our whale questions and explain the behaviours we were seeing. 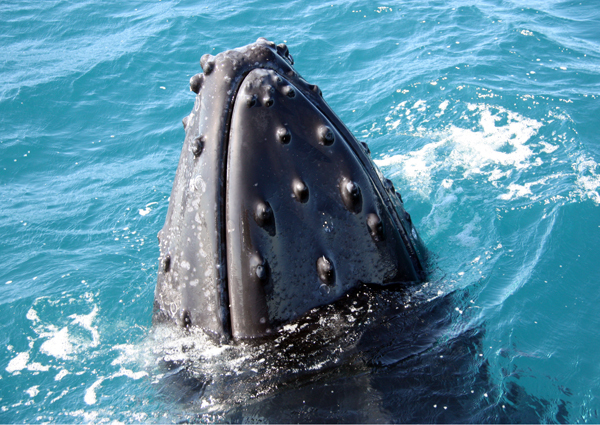 Our particular humpback whales were juveniles, about seven to 10 years old. The day we went was a perfect day with light winds and blue, blue skies. Even when the whales were under the surface, we could see them clearly. It was easy to move around the stable catamaran, although with an ocean swell, you did have to hold on to the rails. The whales were having a good look at the passengers on the lower deck at the back and I decided to see if a whale really would respond to a human waving. After a couple of us waved ours arm for a short time, both whales moved to the front of the boat, right in front of us and popped their heads out of the water. The captain eventually gave us the bad news that we had to return to land. At that moment, the whales began to swim under the boat. While the boat is designed for whale safety, the captain didn’t want to re-start the engines until the whales were clear – not that any of us minded staying longer. Eventually we were able to turn back towards the Gold Coast and I’m sure there were many on board, like me, who thought, “I have to do this again!” We sometimes forget that just a short distance from city skyscrapers is an ocean full of beautiful, wild creatures. 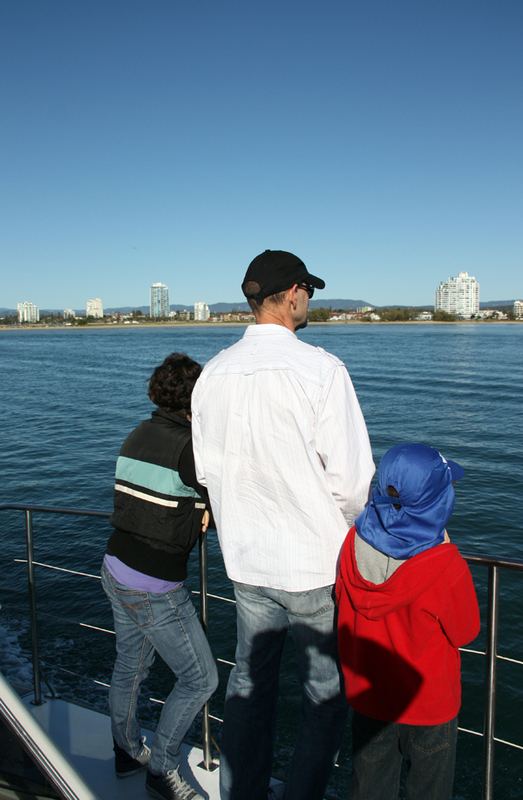 Whale watching is an activity the whole family can enjoy. The Whales in Paradise boat was good for young children with a shaded lower deck and plenty of seating, while still having excellent views of the whales. If you were taking young children onto the front or upper decks, you’d need to supervise them closely, particularly if there was an ocean swell. My nine year old had no trouble hanging on while he was watching the whales on the front deck and he said the whole experience was “awesome”. There are toilets on board and plenty of shade. There’s also a quiet, sheltered inside area with comfy padded seats if you need a break from the excitement. I wasn’t expecting to also have a river tour, so the 40 minute cruise along the Nerang River was a nice bonus. The captain pointed out some quirky features including a floating wedding chapel and a drive-through bottle shop (liquor store) for boats. We also took a look at some of the riverside mansions owned by the rich and famous. I particularly liked the sweeping roof line of Jackie Chan’s riverside home. Once you pass under the bridges, there are good views of the Gold Coast Hinterland mountains and the Surfers Paradise skyscrapers including one of Australia’s tallest buildings, Q1. At this stage you can move around the boat’s decks for 360 degree views of the waterway. We went on the morning cruise, but if you take an afternoon trip, you’ll see Surfers Paradise light up as you return at twilight or sunset. If you are worried about this, the crew offer sea sickness tablets for $2. You will need to take these while you are still on the river for them to work properly. There are sick bags on board just in case. We brought our own sandwiches and fruit for morning tea on board. There is free tea and coffee and biscuits (cookies) available. On the way back they served $5 Coronas. Because Whales in Paradise is located right on the river end of Cavill Avenue, there are plenty of places to eat before or after your whale watching experience. Cavill Mall is a short stroll away and this outdoor shopping and dining strip leads right through to the beach. We parked under the Chevron Renaissance Centre at 23 Ferny Avenue and there’s also closer parking at Circle on Caville at 9 Ferny Avenue and a public car park on Beach Road diagonally opposite the check-in terminal. You check in 20 minutes prior to departure at the kiosk on the corner of Cavil Avenue and Ferny Avenue. The signage says “Sightseeing Cruises”. If you arrive early, the riverside is a pleasant place to wait, and there are coffee shops nearby. Purchase online directly from www.whalesinparadise.com.au or phone 1800 942 547. If you’re visiting the Gold Coast, many hotels and holiday apartments can arrange tickets for you. Look out for combination deals which provide good value – for example, there will sometimes be a Dreamworld plus whale watching package. If you’re a member of RACQ or NRMA, it’s worth checking their sites for discount whale watching offers. If you’ve had a whale watching experience in Queensland, please feel free to share your experiences in the Comments box below. This entry was posted in Activities, Families, Outdoors, Places to visit, Things To Do. Bookmark the permalink.